The Zion80 Vinyl Challenge: Help Us Get There by June 30! It may have seemed a bit quiet in Zion80 land recently, but rest assured we’re working super hard to get everything ready for the epic release of WARRIORS! 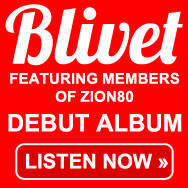 Previous Previous post: Zion80 on Vinyl??! ?